Well the big, beautiful, beast arrived yesterday. After years of Windows, I am switching back to Mac. I got my first computer, an Apple IIe in 1983. I’ve often joked that if I had bought either Apple or Microsoft stock instead of the computer, I would be a millionaire by now. But I loved that computer with typical Apple mania. It had a whopping 64 kb of RAM (that is kilobytes, not megabytes or gigabytes). The monitor was a green cathode ray tube. It was wonderful. 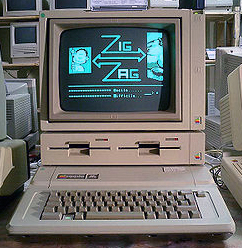 Then I upgraded to an Apple IIGS. That was a monster of a machine. It had a color monitor, 8 MB of RAM and could display 256 colors on the screen. With this machine, I learned about modems, message boards, and eventually email and the World Wide Web. By the late 1990’s, Windows was dominating the market. Programs for Apple were hard to come by, so I got my first of a series of Dell PC’s. They have been good solid work horses. And since Windows XP, the OS has finally been stable. But the computer landscape never sits still. Where programs ruled the 90’s, this century is more about connections and the internet. Also, since the iPod, Apple has regained market share. I’ve been running a hybrid home network for the last 14 years. When I abandoned my trusty, old Apple, my wife adopted it to learn about ebay, email and the rest of the Web. She has had her succession of Mac’s along the way. So by switching back to Mac, I will only have to maintain one operating system. Also the networking will be easier. And now 99% of what I do is word processing, surfing, spreadsheets and photography. All these things run smoothly on the Mac. 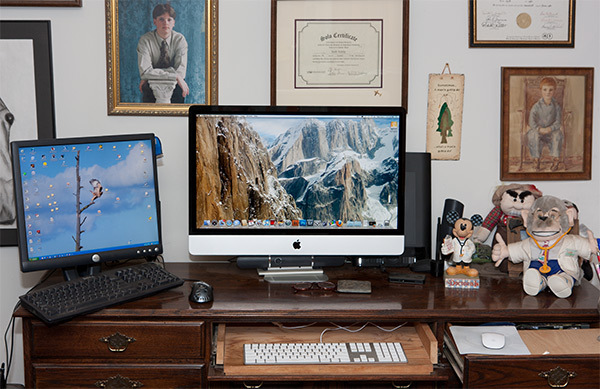 So to get back to the start of this post, my new 27″ iMac arrived yesterday. I spent 15 minutes setting it up (15 minutes to get it set up, plugged in, registered and my email running!). Now on to the process of installing programs, transferring files and getting comfortable with it. It’s like Christmas in August.